Just one day after President Barack Obama signed into law a bipartisan deal to end the government shutdown and avoid default, the US debt surged a record $328 billion, the first day the government was able to borrow money. 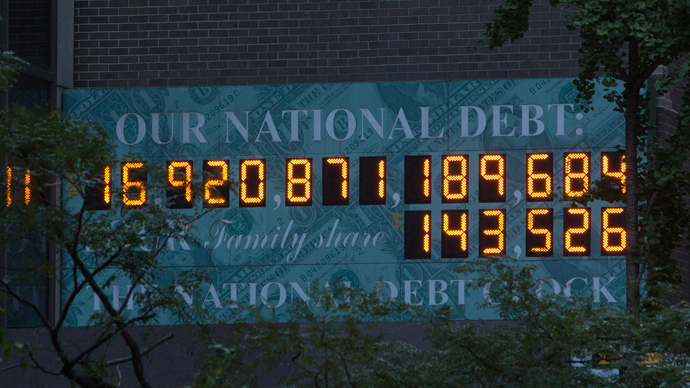 Fasten your seatbelt, because the US debt rate is racing out of control and nobody seems to know where or when the spending will end: The US debt now equals $17.075 trillion, according to figures the Treasury Department posted online on Friday. The one-day increase of $328 billion to the US debt load smashed the previous record of $238 billion set two years ago. The huge leap toward what some economists fear will be eventual insolvency was blamed on the government replenishing its supply of "extraordinary measures," that is, the federal funds it borrowed from over the last five months in a desperate effort to avoid hitting the debt ceiling. Under the law, government coffers are refilled once there is “new debt space,” according to a report in The Washington Times. The Treasury Department was forced under so-called “extraordinary measures” to borrow $400 billion beginning in May, in anticipation of an agreement between Congress and Obama. If the rate of spending continues as it has over the last five months, US debt may eventually by as much as $700 billion before it must apply for another increase to the debt ceiling. Republicans, who came under intense criticism for “holding the government hostage” by demanding an overhaul of Obama’s healthcare legislation, eased off on their unpopular demands without demanding any spending cuts. On Wednesday, the Democrats and Republicans pushed through last-minute legislation ending a 16-day government shutdown and extending the already high debt ceiling to avert a default that would have had serious global economic repercussions. Standard & Poor's said on Wednesday that the partial US government shutdown, the first in 17 years, had already trimmed $24bn from the American economy and would reflect poorly on economic data in the fourth quarter.